Personnel - Gilad Hekselman: guitar; Aaron Parks: keyboards; Rick Rosato: bass; Jonathan Pinson: drums; Kush Abadey: drums. 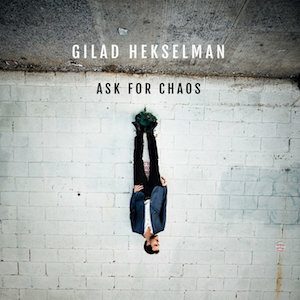 The demand for and accomplishment of New York-based jazz guitar stylist Gilad Hekselman, a native from Israel, is a predicted reward for his enormous talent. Comprising 10 striking originals brought into play by two distinct new trios, Ask For Chaos is to be released on his own imprint Hexophonic Music in partnership with Motema Music. Following the classic guitar formation, The gHex Trio features bassist Rick Rosato and drummer Jonathan Pinson, whereas the adventurous bass-free ZuperOctave has Aaron Parks on keyboards and Kush Abadey on drums. Strategically, Hekselman interspersed the work of both bands so surprising effects hailed from the contrasting sounds could be a constant. The album kicks off in ZuperOctave-mode with “Prolog00001101”, a 23-second exercise on guitar pointillism mixed with a binary-patterned electronic vibe that clearly alludes to digital technology. This piece serves as an introduction to “VBlues”, an asymmetric blues with round and methodical funky bass lines and conspicuous hi-hat monitoring the pulse. Displaying his terrific technique, Hekselman naturally builds a highly developed vocabulary with an incredible sound and extremely tasteful guitar effects. Although the melodic paths of the blues throughout the theme are easily identifiable, the piece sounds unconventionally agreeable through shifting tempos, hauntingly scintillating chord changes, and the alternation of passages that range from strenuous to delicate. The other pieces delivered by ZuperOctave are the well-cooked “Tokyo Cookie”, where pinpointed keyboard and guitar sounds give its place to a blend of acid funk and electronica before veering again toward a prog rock direction; “Stumble”, a downbeat item based on Wayne Shorter’s “Fall”, which still allows the shinning rays of the sun crossing through its texture; “Home To You”, an enchanting song harmonically driven by Parks’ tonal chords and with improvisational guitar-piano interspersion; and the lifting “Clap Clap”, a crossover jazz celebration with Metheny-esque passages and an impactful percussive work by Abadey. The gHex Trio starts with the hopeful ballad “It Will Be Better”, featuring Rosato’s hefty bass solo over a moderately intensive yet texturally rich guitar-drums accompaniment; the sparkling Brazilian-jazz of “Milton”, a tribute to the musical genius of Milton Nascimento; the folk-tinged “Little Song For You”; and the country pop feel of “Do Re Mi Fa Sol”, whose indelible melody can be easily whistled. The two trios cohabit the same space seamlessly, creating a diverse program outlined with fresh artistic ideas. This is definitely a career peak for Hekselman, an already consummate young guitarist whose fulfilling music consolidates rock-steady rhythmic engagement and singing quality.